The Resident IT Consultant has kept up a steady pace all week, so just in time for St Andrew’s Day and the First Sunday in Advent, we have shelves. Not just undercoated, but ‘overcoated’ and filled. 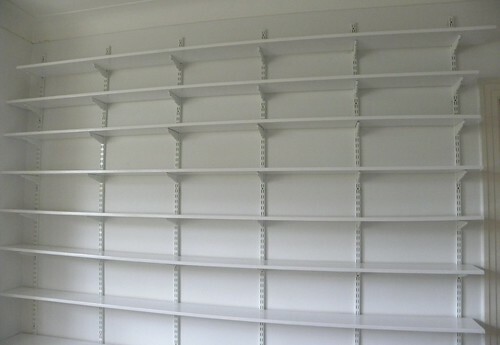 He painted for three days, and then the joiner came and secured the shelves with screws. Except for the one he forgot to do, so that will have to be done on his next visit. 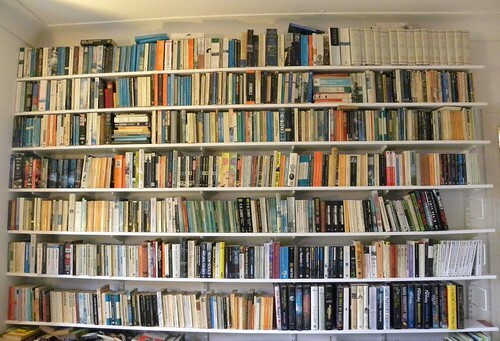 And the day I swanned off to Edinburgh I left a room full of boxed books, and returned to a wall filled with books. He’s quite useful that way, the Resident IT Consultant. He even made time to pick me up from the station. My heart is flowing over, and so, obviously, are the shelves. They are generous, taking up a whole wall. But that is never enough, is it? 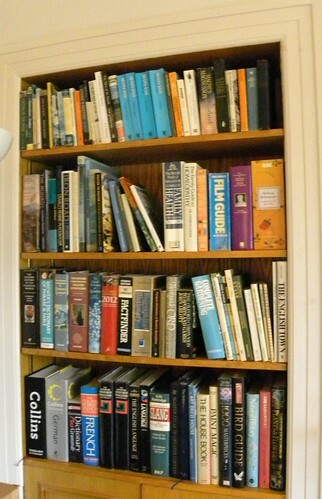 There will, eventually, be more shelves in other rooms, but each step has to be done in the right order. I estimate at least two more months before the next worthwhile contribution to our shelving issues. We spent the following day placing the newly released books in a more orderly fashion, while also pruning quite a bit. I was being very good, sacrificing all my Ann Grangers and my remaining Wycliffes and some of the Ed McBains. We gained a little more space by moving some books to the shelves in the alcove, which until this week had held a number of completely irrelevant items. We’re slowly getting there. Thank you for your time! People have been writing love letters to libraries. Book Week Scotland have urged us to write about our favourite library, and presumably preferably a Scottish one. I don’t believe I have one; either a Scottish one, or even a current favourite library, anywhere. 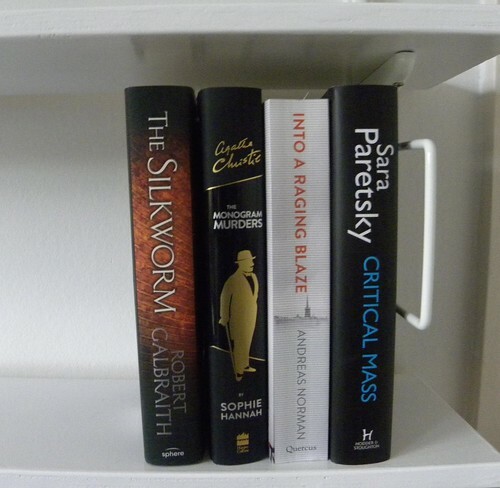 As you know, I don’t tend to visit them very much, already having too many books in the tbr pile. And that feels so wrong, but I can’t spend time visiting the library, borrowing books, which I then won’t read. So my love letter has to be about a library from my past. I have blogged earlier about the main library of my childhood home town, so won’t repeat myself by doing it again. And that’s all right, since I feel that it was another library that really moved me. One that no longer exists. Or so I suspect. We had a library at school. Obviously. And then we had a classroom library. For the first two years, I think it was, we only used the classroom library. I’m guessing it was in order to get us used to browsing and borrowing, while also offering age (seven and eight) appropriate books. The books were spread out lining the classroom walls, and I think it was just one day a week. The rest of the time the books must have been kept in a box or a cupboard. There can’t have been many books, yet there was ample choice. I never felt there was anything lacking. And I’m pretty sure the reason I kept re-borrowing one particular book wasn’t due to limited choice. I simply loved this book (which I have long forgotten the title of). I know my teacher noticed how often I carried it home to re-read over the next week. It was about a young girl in hospital, and I’m not sure why I was so fascinated by it. We probably ‘had to’ borrow at least one book each week. There was no force involved for me, and I don’t think anyone had to actually read what they borrowed. I suppose in some cases there might even have been accidental reading happening. The book came home with you, and you just happened to read it if it looked more fun than you imagined a book could be. I don’t know. But it was a good start. The classroom was safe and familiar, and so was the teacher acting as librarian. And my reading has been a little more varied after that. It might have been a dreich November night, but my route through Edinburgh from Waverley to Blackwell’s took me through the Christmas Market in Princes Street Gardens to the Scottish National Gallery (no I was not lost) and up the hill past the charming St Bookwitch Street and St Bookwitch Cathedral, and slightly down again (such a waste of the uphill!) to my event with Elizabeth Laird. To be perfectly honest, I’d forgotten what it was to be about, but that doesn’t matter when it’s Liz. It will be good. And it was. The event was for adults, which was lucky, because last night Elizabeth used rather more adult language, if you know what I mean. You also needed to know your Bible well, so I was on slightly shaky ground. I was early (no surprise there) so was able to hog a corner of the sofa, and when I remembered I’d forgotten to eat my sandwich on the way, I asked for and was granted permission to eat. 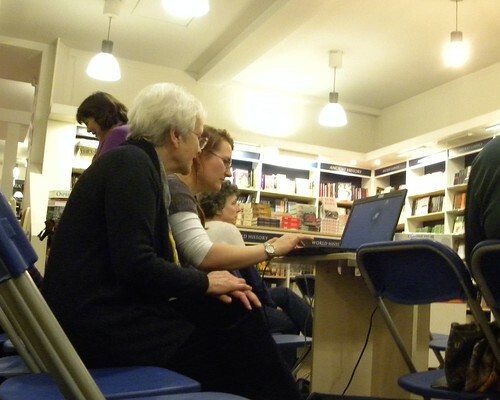 There were mainly women in the audience. Perhaps that’s as it should be, since Elizabeth reckoned it was the women in Ethiopia who had the best stories to tell. She said that she was going to ‘drone on about Ethiopia’ and we should interrupt if necessary. 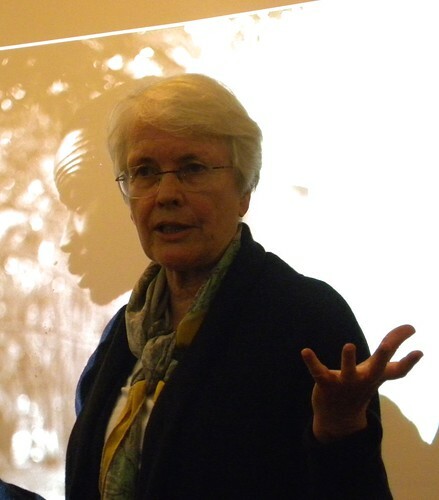 Her book The Lure of the Honeybird, began when Elizabeth returned to Ethiopia in 1996, after thirty years away. There was an encounter with an ‘ant motorway,’ and a farmer telling her a marvellous story about ants. 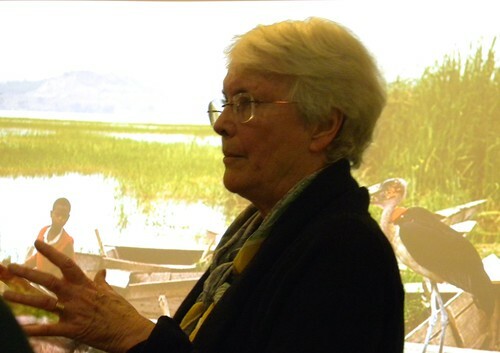 Elizabeth promptly forgot how the story went, but she came up with an idea, and she talked to the British Council and demanded a Landrover and an interpreter so she could travel and learn new stories and write two books. This was deemed to be such a good idea that a demand for 24 books was made, and Elizabeth found herself travelling round the mud and the bureaucracy with a driver and an interpreter. Because the thing is, Elizabeth told us these stories. She didn’t just talk about how she went about finding them, but showed us her photos, described the people she met, and which of them had an interesting story to share. And she can definitely tell a story! Was it worth risking the lives of her driver, her interpreter and herself for these stories? Yes, she believes it was. Now. Walking through tall grass with pythons and lions on either side wasn’t quite such fun at the time. Nor was driving along a road where only the day before people had been kidnapped and killed. When she met a group of naked women, far away from anywhere else, she found it difficult to get them to understand what she wanted to hear, so as an example she told them about Little Red Riding Hood (the unexpurgated version) and they all agreed about the unsuitability of walking alone in the woods, and of talking to the wrong man. 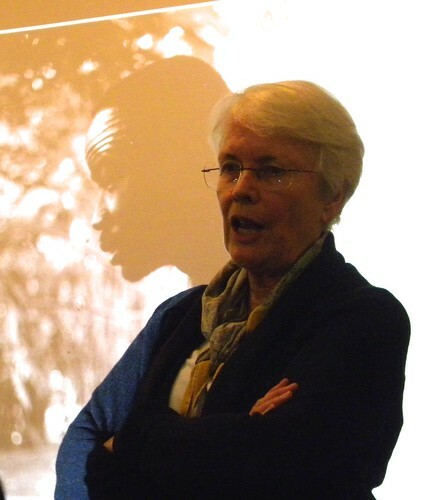 Elizabeth told us many stories from Ethiopia last night. If you want more you can read The Lure of the Honeybird, or you could try these websites, recently set up by Elizabeth: ethiopianfolktales.com and ethiopianenglishreaders.com. Both have been financed with the help of one of her students from the 1960s, whom she just happened to meet in London one day. He’s now a fund giver, which is nice, since so many of Elizabeth’s other students are dead, having turned revolutionaries while attending university, instead of becoming teachers as they were meant to. You’ll wish you’d been there. Elizabeth Laird is a fantastic storyteller. And she may well have been scared when out collecting the stories, but it’s only the brave who do this kind of thing, and who don’t mind admitting to being frightened. She’s also a beautiful woman, and I have yet again failed to take photos that do her justice. You will have to take my word for it. Cabers were tossed. Also, there’s a most capable Grandma (as they should be), there’s Nessie, beautiful scenery, an efficient and helpful train crew. 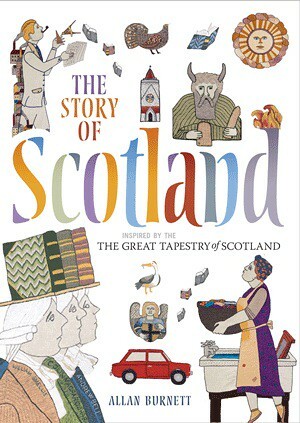 In short, James Mayhew’s Katie in Scotland has all you could want from a picture book about Scotland. I don’t know why I’ve never investigated James’s books before. I suspect I might be an idiot. This is a truly lovely picture book, and one for which there is absolutely no need to be a child to enjoy. It begins with Grandma, who takes Katie and her brother Jack to see Nessie. I mean, to see Loch Ness. You just have to believe in Nessie, though, and there she is! And she wants to travel and see Edinburgh. 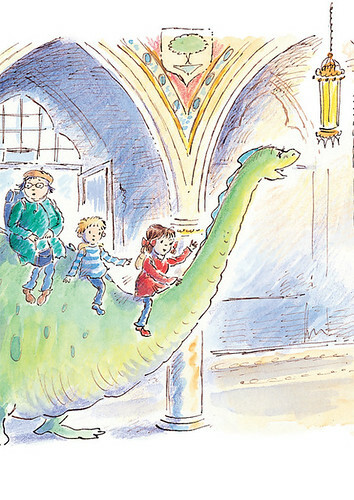 So obviously they take her along on their trip and a train coach is organised for Nessie and they visit Glasgow and then it’s on to Edinburgh. They look at the famous sights and before getting on the train home, they perform in Princes Street Gardens; a bit of caber tossing, Scottish dancing, kilts. The works. You know what to expect. A good time is had by all, from Nessie to the readers of this book. And if you’ve not been to Scotland before, you’ll want to go now. Find a Grandma who will take you. Perhaps better suited to the YA readers Kirkland had in mind, than us oldies, it’s still fascinating and will potentially give us an insight into the warped minds of some teenagers. Or are they warped? I don’t know. 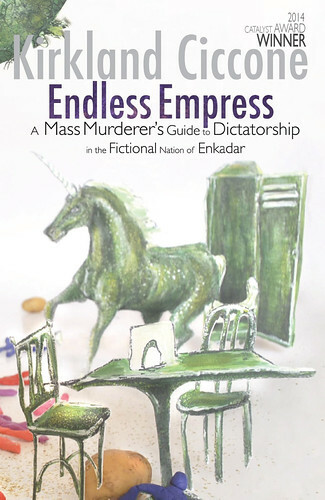 Maybe this was all a game, and perhaps there really wasn’t a crazy ‘Empress’ who enticed a gang of mid-teens to kill most of the students at their high school. You can’t be certain. Perhaps the Empress played with their minds, or is Kirkland playing with ours? Beware of lunchboxes! And as I say that, I can’t get Kirkland’s Kurt Cobain lunchbox out of my head. I don’t want to know what’s in it. Or maybe I do. Just to make sure. This is the slightly confusing story about a group of six teenagers who believe in the fictional state of Enkadar, and who hate the other children at school and want them dead. Or their Empress does. Set a few years after the bomb at their school went off, the tale weaves back and forth between then and now. It’s occasionally hard to know where you are, and when, but I guess that’s the point. Keep everyone on their toes. I noticed that looking back to the first pages, you find lots of hints of what is to come. It’s quite obvious, in fact. And chilling. There could be many teenagers who will identify with the feelings of the Empress. I just hope they won’t do what the characters did. And do. And don’t eat the sandwiches! The Tobermory Cat is back. 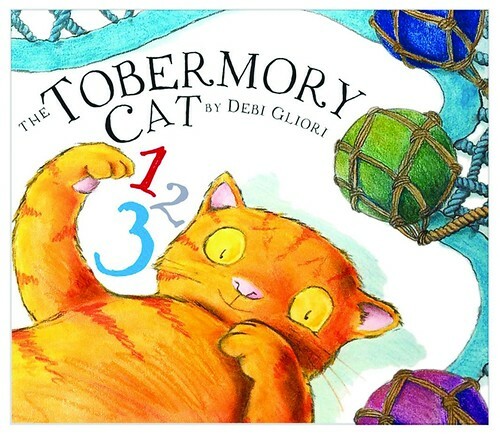 This time he – and Debi Gliori – teach young readers to count. He’s such a hungry cat that I was reminded of Six Dinner Sid, although TC appears to have a mere five houses in which to have lunch. How he can possibly have room for snacks before dinner is beyond me. But TC is a clever and capable cat. Still as orange as ever, TC thinks, and dreams, mainly about food, from breakfast to his bedtime drink. Between meals he fights wasps, sleeps on cars and has his photograph taken by lots of people. Whatever he does, we can count it. This is a great start to Book Week Scotland. There are one, two, three, four, five, six days left. Isn’t that right, Tobermory Cat?